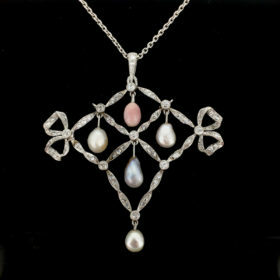 Heritagem presents:This beautiful antique pendant is from the Victorian era. 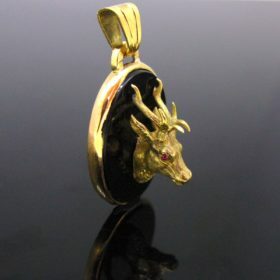 It is adorned with a realistic deer’s head made in 18kt solid gold. It was perfectly gold crafted. The eyes are in rubies. It is set on an onyx plaque, set on 18kt yellow gold. The rim presents one dent on the left side, however it in very good antique condition. Please note that the chain is not provided. This ravishing pendant comes directly from the Art Nouveau era with the flowers and the flowing lines. The motif represents a nice bow set with rose cut diamonds and a pearl in the centre; with flowers and branches set with natural pearls. There is also a dangling pearl at the bottom. 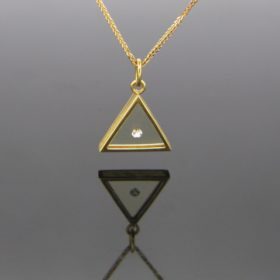 The pendant is fully made in 18kt yellow gold.Please note that the chain is not included.All our items come with either a gemmological report or a jewellery report with circa and all useful information. This ravishing French pendant depicted a four-leaf clover. 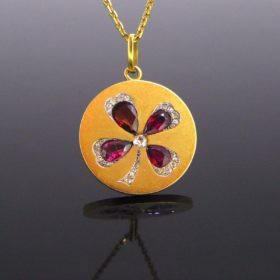 The pendant is set with 3 rubies and one garnet. The garnet is the one on the top left. It is adorned with old mine and rose cut diamonds. The pendant was made at the beginning of the 20th century during the Belle Epoque in France. It is made in 18kt gold and platinum. The bale is controlled with the French eagle’s head. Please note that the chain is not included.All our items come with either a gemmological report or a jewellery report with circa and all useful information. 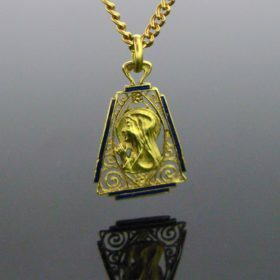 Heritagem presents:This lovely pendant comes from the Art Nouveau period. It is cut out with the word JANVIER – January in French. The centre is adorned with an emerald, surrounded with leaves of holly. It was controlled with the French eagle’s and we can see the maker’s mark. If you are born in January, this medal is for you! Please note that the chain is not provided.All our items come with either a gemmological report or a jewellery report with circa and all useful information. 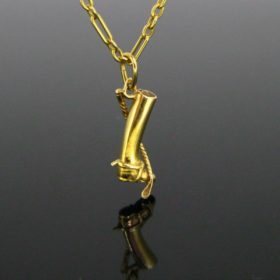 This ravishing pendant is featuring a horse rider’s boot with his crop. This one was beautifully handcrafted in 18kt yellow gold. 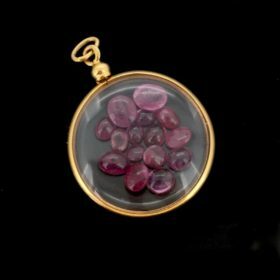 It could be worn as a pendant and also as a charm.Please note that the chain is not provided.All our items come with either a gemmological report or a jewellery report with circa and all useful information. This lovely medal features the profile of a praying young woman, probably the Virgin Mary or a Saint. The medal has beautiful scrollwork with flowery details. It is framed with blue enamel. The back was nicely engraved with the name Annie and a date 10/7/46, a birth date, a christening or 1st communion date. Religious medals are used to be gifted for a special occasion and it accompanies the person during their whole life. This one is in good condition. Please note that the chain is not provided - feel free to enquire if you would like to buy one.All our items come with either a gemmological report or a jewellery report with circa and all useful information. This unique medal is made in 18kt yellow gold. The medal is hollow. It features the profile of a Gallic warrior. He wears a torque necklace and a refined helmet. The initial CF are visible on the left. On the right, we can see a signature B Bigard. It was made during the Art Nouveau period. The medal was controlled with the French eagle’s head and the maker’s mark. All our items come with either a gemmological report or a jewellery report with circa and all useful information. This beautiful medal is signed by the medallist Tairac. It features the profile of a young saint, probably the Virgin Mary. She wears a fleur de Lys, her attribute. The back is also engraved with fleurs de Lys. Art Nouveau's style was strongly inspired by this kind of design: flowers, nature, birds and makes any jewels of this period very poetic.All our items come with either a gemmological report or a jewellery report with circa and all useful information. 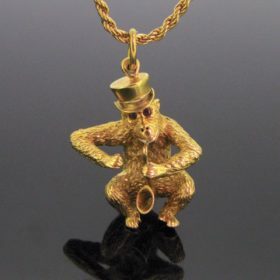 Heritagem presents:A vintage yellow gold chimpanzee pendant from the 1960s. This pendant features a chimpanzee wearing and playing the trumpet – so fun! 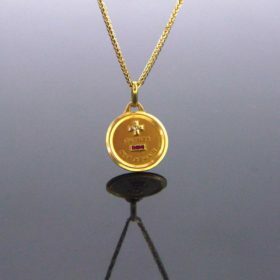 The detail of the design on the pendant is amazing – it is made in 18kt yellow gold and the eyes are made with rubies. It measures 34,25mm x 27,27mm / 1,35in x 1,07in and weighs 21,3gr. It is marked with the French hallmark the owl and also with “Made Italy”. A very fun gift to give to someone or to get for yourself! 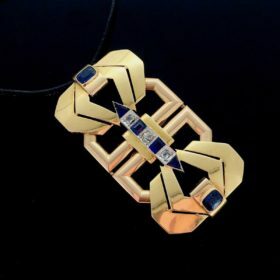 Heritagem presents : A fabulous Art Deco pendant. This one has a stunning geomerric design. It is set with 3 old and rose cut diamonds (tcw : 0,60ct approximately) and with 6 naturals sapphires : 2 ovals, 2 triangles and 2 tappers cut. 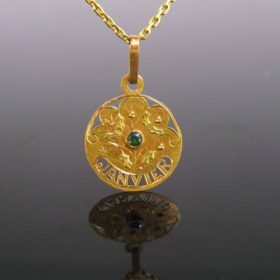 The pendant was beautifully handcrafted in 18kt rose and yellow gold. The gemstones set in the middle are set on platinum. This pendant has a wonderful display of an open cut detailing and a unique shape. If you are a lover of Art Deco period, this pendant is a must have in your jewellery box. All our items come with either a gemological report or a jewellery report with circa and all useful information. 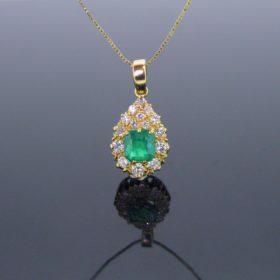 Heritagem Presents :A ravishing emerald and diamonds pendant on chain. The pendant is adorned with a beautiful green emerald weighing around 1,20ct. It is enhanced with brilliant cut diamonds on a pear shape pendant with a total carat weight of 0,80ct approximately. This necklace is perfect for everyday. Emerald is the stone of people born in May. Heritagem presents :This outstanding necklace is a real testimony of the Edwardian period. 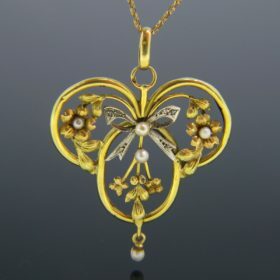 It comprises a 18kt gold chain and a magnificent pendant adorned with 2 ribbons, naturals pearls and diamonds. It is set with 8 old mine cut diamonds and rose cut diamonds. Each compartment encloses a natural pearl : the top one is a conch pearl (7.10 x 5.15 mm), the pearl on the right has a greyish tint (7.09x5.8mm), the pearl on the left has a creamy tint (8.78x5.6) and the last one on the bottom is (6.65 x5.3mm). It was perfectly well handcrafted. The chain is made in 18kt gold and it measures 40 cm long. The necklace weighs 12,2 gr and it is in very good antique condition. The pendant measures 58,38 (2,29) by 53,11(2.09) mm (inch).It was made at the very beginning of the 20th century in France during the Belle Epoque (Edwardian era). The clasp of the chain is marked with the French eagle's head as the hinge of the pendant. This necklace is absolutely ravishing , it is very refined. It will enhanced any outfit of your wardrobe. If you are a lover of Belle Epoque jewellery, this one is for you. Pearl symbolises purity and innocence; they are usually worn by the bride for her wedding. The legend said that pearls are the tear-drops of the moon, fallen in the sea. This is the only birthstone which has 5 months of the year : February, April, June (traditional) and November.All our items come with either a gemological report or a jewellery report with circa and all useful information. Heritagem presents :A brown diamond pendant on a chain. 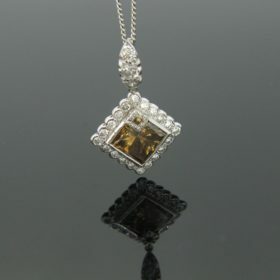 This necklace goes with a ravishing brown diamond pendant. The chocolate princess cut diamond is around 3.60ct and it has this wonderful color. It is surrounded with 21 brilliant cut white diamonds. The hinge is also adorned with brilliant cut diamonds. There is an approximate total carat weight of 1ct for the white diamonds. 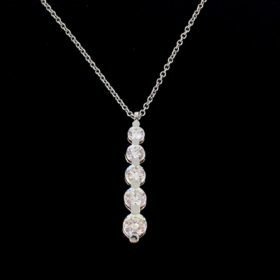 This necklace has a timeless design and could be worn at any time of the day.All our items come with either a gemological report or a jewellery report with circa and all useful information. Heritagem presents:This 18 karat yellow pendant locket features a lovely design with flowers. This round form matches perfectly with two portrait's pictures. 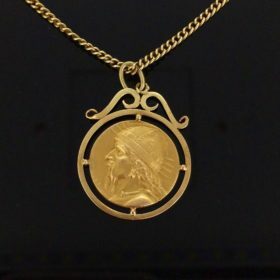 There is one gold circles you can remove to fix the pictures inside, and you can also add a picture on the other side.There is no chain provided here but it could be worn with a long chain or a black ribbon. Do not hesitate to ask and we can find the perfect one you want. The clasp opens easily and snaps shut firmly. It is in very condition for an item of this period (c. 1900/1905) even though there are few traces of wears. The flowery crown is a bit tarnished but it made on purpose for accentuate the relief. 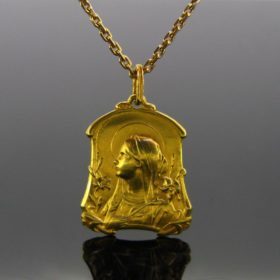 I have given the locket a light polish with polishing cloth to bring out the shine.The pendant is marked with the Eagle's head the French mark for 18 karat gold. It weighs 6,5 gr and measures 35 (1,38) x 25,19 (0,99) x 4,37 (0,17') mm. The bale is included in the high.Art Nouveau's style was strongly inspired by this kind of design : flowers, nature, birds and makes any jewels of this period very poetic.All our items come with either a gemological report or a jewellery report with circa and all useful information. Heritagem presents : A unique French medal. 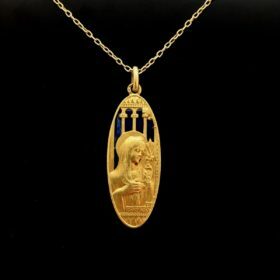 This oval 18kt gold pendant is a beautiful piece of the early 20th century. It shows a woman saint carrying a lily, symbol of purity. This flower is also strongly linked with Mary, mother of Christ. The woman stands on a cloister, with a blue sky, made of blue enamel with the Plique a Jour technique. How refined is this one !The back was engraved into a beautiful cursive letter: 1re Comon Jenny Caulier 20 Mai 1926. The medal was probably made at the very beginning of the 20th century during the Art Nouveau period, and then engraved for the First Communion of Jenny. The medal was signed on the left bottom : POL. MASSET. The bale is controlled with the French eagle's head. This medal is absolutely ravishing and it is in good antique condition. The left band of blue enamel features a little chip on the front and on the back, however the others bands are intact. The medal weighs 3,6 gr and it measures 47,56 (1,47) x 12,50 (0,49) mm (inch.). All our items come with either a gemological report or a jewellery report with circa and all useful information. 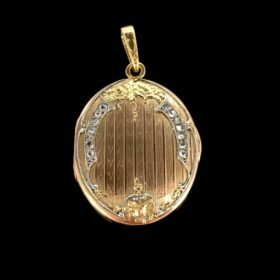 Heritagem presents: This lovely French medal pendant was made by Augis. It weighs 1,9 gr and measures 22,01(0,86')x 14,76(0,58) mm (the bale is included in the high). The plus is set with a diamond and the minus with 2 rectangular synthetic rubies. The medal is signed A.AUGIS on the right.It is wrote in French: " + qu'hier - que demain ": "I love you more than I did yesterday and less than I will tomorrow.”The French saying comes from the verse of the poem wrote by Mrs Rosemonde Gerard to her lover and husband: Edmond Rostand, the famous French writer of Cyrano de Bergerac, a dramatic love play. 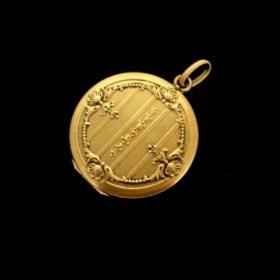 Alphonse Augis, a French jeweler's from Lyon, made a love medallion with this verse written on it. There is the maker's mark is legible on the the hinge: A / a rooster / A. There is also the French eagle's head with the counter mark. The back is plain and could be engraved with the name of the person you love :)The first medals were made from 1907, this one is around 1960. It is in very good condition. All our items come with either a gemological report or a jewellery report with circa and all useful information. 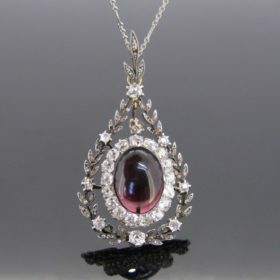 Heritagem presents : A stunning Edwardian / Belle Epoque pendant. This one is really a masterpiece of the very beginning of the 20th century. It was perfectly handcrafted in 18kt gold and silver. The center is set with a deep red almandine garnet (cabochon cut) surrounded with a sparkling crown of 17 old mine cut diamonds. The overall is adorned with a ravishing crown of petals set with rose cut diamonds. There is a total carat weight of 4,50ct. The diamonds are in good condition, lively and bright. The garnet is 18 mm x 13,3 mm x 4,8 mm. Almandine Garnet celebrates two years of wedding anniversary. It was used a lot during the second part of the 19th century. It's a must have in our jewelry antique box ! The pendant weighs 12gr and it measures 6,3 cm long and 3cm large. All our items come with either a gemological report or a jewellery report with circa and all useful information. 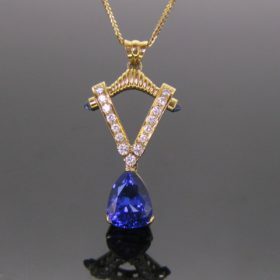 A unique design and fashion Tanzanite pendant. This one is set with brilliant cut diamonds, 2 cabochon cut on the side and magnified with a drop Tanzanite. This one measures approximately 7ct and it has a stunning deep bluish purple color. The tanzanite is a rare gemstone which was discover during the Fifties in Tanzania, from which takes its name. You can only find this gem in Tanzania and it is very sought-after after the sapphire. Its color changes blue to indigo on a different source of light. There is an approximate total carat weight of 1ct for the diamonds. 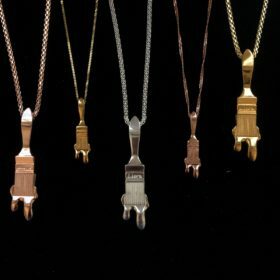 This pendant has a unique design. Feel free to ask a chain we will be happy to find the perfect one to go with this pendant. 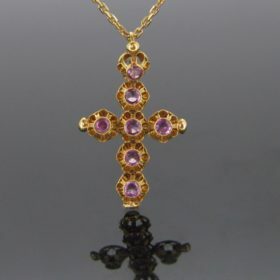 Heritagem presents : A ravishing amethysts cross. The cross was beautifully handcrafted in 18kt gold. It is adorned with 6 round cut amethysts with an illusion setting. The bale is also adorned with the famous purple gemstone. The amethyst's name comes from the Greek : a (without) methysto (drunkenness). The stone may has the power to protect from drunkenness. But nowadays, it symbolises loyalty, sincerity and wisdom. The hinge and the bale were controlled with the eagle's head. It was made in France at the end of the 19th century. The cross weighs 3,1gr and it measures 39,79 (1,56') mm long and 24,64(0,97) large.It is in very good antique condition. All our items come with either a gemological report or a jewellery report with circa and all useful information. Heritagem presents: This 18 karat yellow and rose gold pendant locket was beautiful handcrafted with geometric motifs and flowers (rose and daisy on the top and probably 2 dandelions on the bottom). The front is adorned with rose cut diamonds on each side. How refined is it ! This oval form matches perfectly with two portrait's pictures. There is one gold circles you can remove to fix the pictures inside, and you can also add a picture on the other side.There is no chain provided here but it could be wear with a long chain or a black ribbon. Do not hesitate to ask and we can find the perfect one you want for. The clasp opens easily and snaps shut firmly. 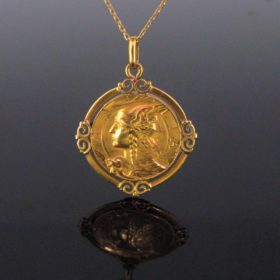 It is in very condition for an item of this period (c. 1900/1905) even though there are few traces of wear, barely visible.The pendant is marked with the Eagle's head the French mark for 18 karat gold, and an other mark, which seems to be the maker's mark but it is unfortunately quite hard to read. It weighs 6,1 gr and measures 38,69 (1,52) x 23,48 (0,92) x 3,72 (0,15') mm. The bale is included in the high and was also nicely engraved.Art Nouveau's style was strongly inspired by this kind of design : flowers, nature, birds and makes any jewels of this period very poetic. All our items come with either a gemological report or a jewellery report with circa and all useful information. Heritagem presents : A unique piece made by the French Jeweler Pascal MORABITO. In 1972 he created a cube made in synthetic crystal with golden edge with a trapped diamond inside. The cube was name the Captive Diamond. Its creation is now exhibited in New York in the Museum of Modern Art. Then, the triangle appeared. This one is an authentic Morabito. 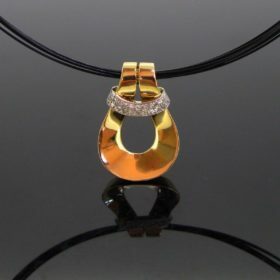 The pendant weighs 2,2gr and a brilliant cut diamond of 0,05ct is "captive" inside the pristine crystal. The pendant is 24,46 (0,96) x 18,50 (0,72) x 4 (0,16) mm (inch). They are few traces of wears but barely legible. The pendant is in very good vintage condition. It was controlled with the French eagle's head for 18kt gold, there is also the maker's mark but it is quite hard to read (SE / a bag ?). All our items come with either a gemological report or a jewellery report with circa and all useful information.